Alberta Falls is 30-foot waterfall thunders down a small gorge on Glacier Creek, and offers hikers an excellent spot to enjoy a relaxing picnic.Alberta Falls is one of the most popular, short destination hikes in the park, and for good reason. If you only have time for one short hike on the East Side of RMNP, this is a great choice. The hike to Alberta Falls begins from the Glacier Gorge Trailhead, located on Bear Lake Road almost 8 miles from the turn-off at Highway 36. Due to the extreme popularity of the Bear Lake Road area you may want to consider using the free park shuttle to reach the trailhead during the peak tourist season. Roughly one-quarter of a mile from the parking area, just after crossing Chaos Creek, the trail briefly converges with the Glacier Creek Trail. After walking a very short distance the Glacier Creek Trail splits off to the right and heads toward Bear Lake. To continue on towards Alberta Falls hikers should turn left at this junction. As it travels towards the waterfall the route alternates between a mixed pine forest and aspen groves, thus making this a great option for a fall hike. 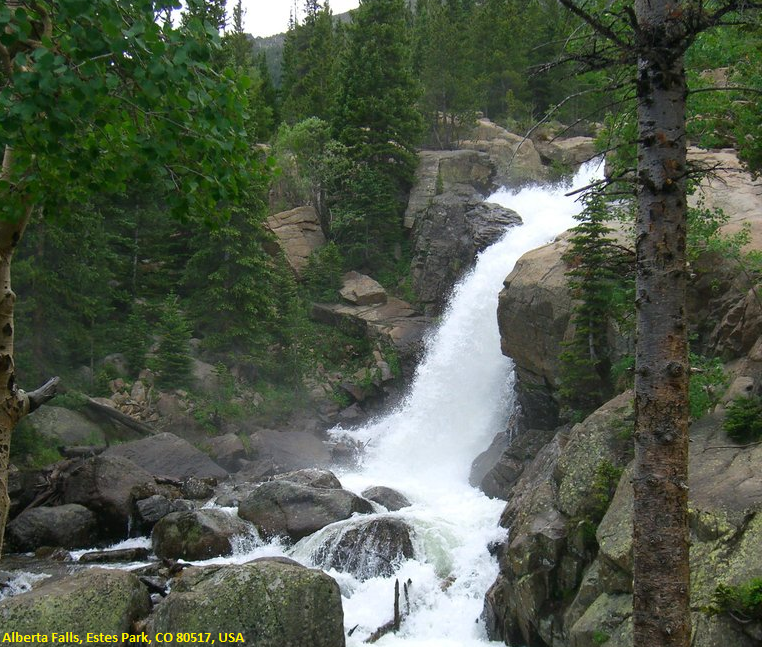 At just over eight-tenths of a mile hikers will reach Alberta Falls, one of the more popular hiking destinations in Rocky Mountain National Park.